About Us | Caristrap International Inc. 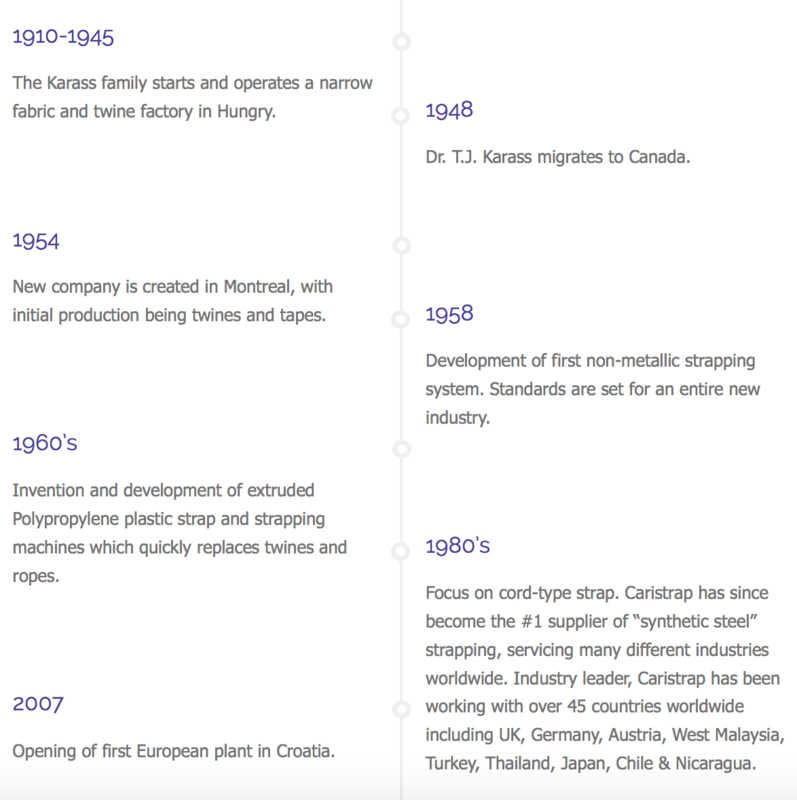 Since Caristrap’s inception in 1954, we have grown steadily and have earned key positions in many markets, due to our ability to develop versatile and cost competitive solutions in strapping systems that respond to ever changing customer requirements. Today, our products are being used around the world and patents in several countries protect many of our inventions. Our facilities include a highly integrated factory, proprietary machinery, development and testing laboratory. We are proud to be the first non-metallic strapping to be approved by AAR (Association of American Railroads) and the first to achieve ISO 9001 Certification. Since then, we have pursued our commitment to continuous product improvement. Indeed, as part of the ASTM (American Society for Testing and Materials), we have worked, with other members, to develop and improve worldwide standards within our industry. The Caristrap family is proud to celebrate 60 years in business and from this point we are the most experienced manufacturer in the world of cord strapping. We are happy to invite you to read through our website and find out all there is to know about our products, accessories and tools. By doing so, you will discover ways to facilitate all your packaging and shipping needs while creating a safer working environment for your staff. Our goal is to “Take care of our customers & build solid foundations“. We are accomplishing this by being the safest, highest quality, lowest cost, most productive and most profitable non-metallic strapping product company in the world. We are committed to doing this while being cultural and environmental stewards in our communities where we live and work. We are succeeding by working together.